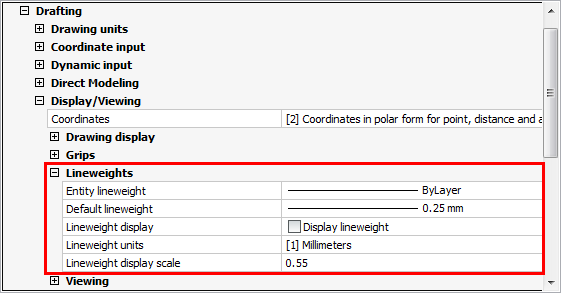 Lineweights determine how thick or thin entities appear on the screen and / or when printed. The following lineweights are available: BYLAYER, BYBLOCK, DEFAULT and many additional lineweights in millimeters or inches, depending on the Lineweight Units (LWUNITS) system variable..
You cannot assign lineweights to planes, points, TrueType fonts, and raster images. New entities are drawn using the current lineweight. When you create an entity, it is created using the current lineweight. By default, the current lineweight for a new entity is BYLAYER. This means that the entity lineweight is determined by the current layer. When you assign BYLAYER, changing a layer’s lineweight changes the lineweight of all such entities on that layer. Entities created using lineweight BYBLOCK, are drawn using the DEFAULT lineweight until include them into a block. The entities then inherit the block’s lineweight setting when you insert the block into a drawing. The default lineweight is saved in the Default Lineweight (LWDEFAULT) system variable. Entities created using the default lineweight will be adjusted if the Default Lineweight setting is redefined. For entities using an index color, lineweights will be used for printing only if the Color Table (CTB) or Plot Style (STB) is defined as 'Use object lineweight'. Otherwise the line weight is defined by the objects color or plot style. Entities which are created in a true color always use the object line weight when printed. 1. (option) On the BricsCAD Properties Bar, select Lineweight . Choose a lineweight in the drop down list. 2. (option) On the Entity Properties toolbar, click the down arrow next to the Lineweight field, then choose a lineweight in the drop down list. Choose Settings in the Settings menu. Select the Drawing settings category. Expand the Display/Viewing settings sub-category. Expand the Lineweights settings group. (option) Select the Default Lineweight (LWDEFAULT) system variable, then select a lineweight in the drop down list. (option) Select the Lineweight Display (LWDISPLAY) system variable, then click the checkbox to toggle the display of lineweights. 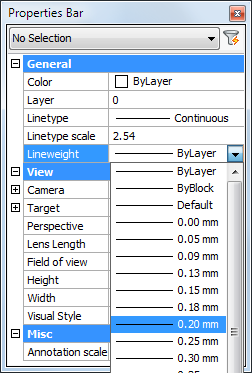 (option) Select the Lineweight Units (LWUNITS) system variable, then choose Millimeters or Inches . Click the lineweight field (LWT) in the Status Bar to toggle the display of lineweights on/off.